We had 20 years to prepare. Unfortunately, so did the aliens. 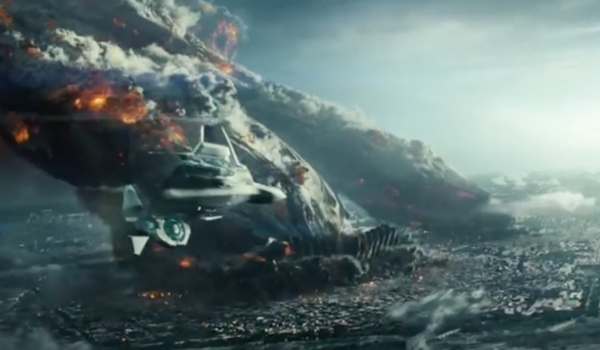 The latest trailer for Roland Emmerich’s Independence Day: Resurgence finally gives us a clear picture of the scale and scope of the anticipated summer blockbuster. As you might imagine, it’s larger than you’d even dreamed. The trailer does a fantastic job of blending the old with the new. The cataclysmic events of the original movie are front and center, as the citizens of Earth prepare to celebrate the 20th anniversary of the time we fought back against an alien invasion. We get Will Smith shown in a photograph held by his son, Dylan (Jessie Usher). We see President Whitmore (Bill Pullman), and the great David Levinson (Jeff Goldblum), back in the middle of the action yet again. But we also see the new generation of fighters who will need to rise up when an alien plan that has been 20 years in the making triggers. On Independence Day. Of course. A lot of Independence Day: Resurgence seems to lean on the notion of, "If it ain’t broke, don’t fix it." Much like the first movie, this shows a versatile ensemble sprinting their way through a 1950s inspired sci-fi monster movie. Only the technology has drastically improved since Roland Emmerich tried to bring Independence Day to life, so the effects on screen look FAR better then they did in 1996. Which is why, as is being shown in the trailer, we now have a Moon Base, and plenty of technology that’s meant to protect us from a potential alien invasion. How do we think our weapons will fare? The size of the alien invasion looks and sounds much larger than the last time. At one point, it’s suggested that the alien threat settles down over the Atlantic Ocean. The ENTIRE Atlantic Ocean. How do you fight back against that? As part of the trailer launch, Fox also shared an amusing Earth Day promo with Jeff Goldblum, in character. "My David!" Independence Day: Resurgence roars into theaters on June 24. Does this new footage get you excited?